A carton stapler is used to close or seal the upper or top part of a corrugated carton box with a metal staple. Here is a rough breakdown on some categories and choices. There are two kinds of carton staplers, the manual carton stapler and the pneumatic carton stapler. The manual carton stapler is manually operated with the force exerted by hand while the pneumatic carton stapler is hand -held but is air-driven. Operation with a pneumatic stapler can be much easier compared to the manual type. The manual carton stapler can be very versatile; it does not require electricity or compressor to operate. It can be used in farm fields or work yards where a compressor may not be available. The pneumatic carton stapler should be considered to increase the productivity because you can close a large quantity of boxes without fatigue. The most popular of the manual carton staplers are the HC150T from the Carton Closing Company, the model 561-15 from the manufacturer Josef Kihlberg. The most popular of the pneumatic carton staplers, on the other had, are the models AC150 from the Carton Closing Company or the 561-15PN, from JK. A particular type of carton stapler that utilizes staples that are bound in rolls is called a roll stapler. It is fastest way for an operator to close boxes with a staple. A roll staple usually has 1000 staples per roll thus it saves time by requiring fewer changes. The most popular of the roll staplers being sold in Boatman Marking are the RC1000 from Carton Closing or the D61 from Stanley-Bostitch. All roll staplers are all pneumatic driven. A giant carton stapler is a special kind of carton stapler used for heavy-duty, thick-walled corrugated carton boxes. There are 4 kinds of giant carton staplers which depend on the leg length of its staples. These lengths, in inches, include: 1, 1 1/8, 1 1/4 and 1 3/8. Carton Closing Company manufactures giant carton staplers that cater to these specific staple lengths and can be purchased through Boatman Marking. 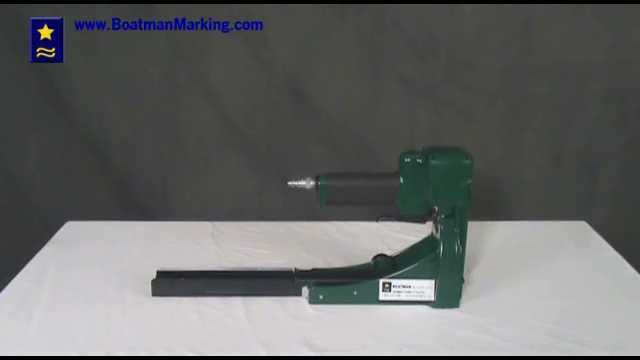 Contact Boatman Marking now to learn which carton stapler is right for you and your company today. Thank you.